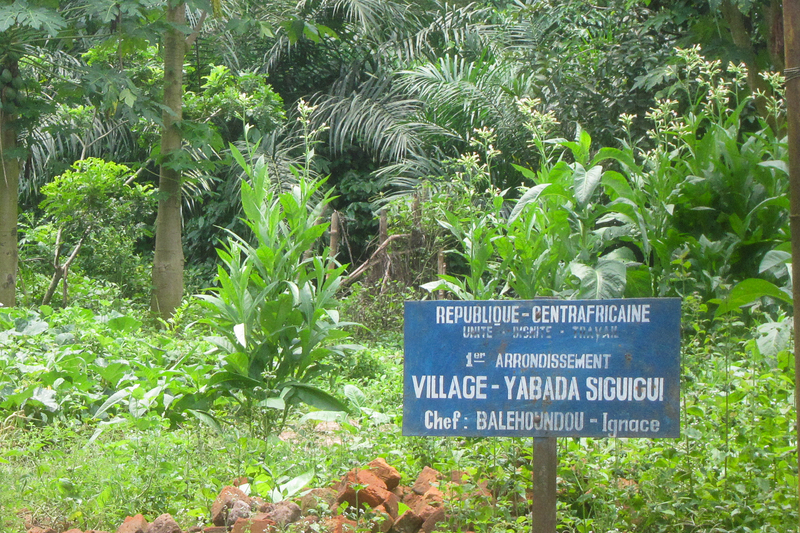 Many years ago, French colonists arrived in a village in what is now the Central African Republic. 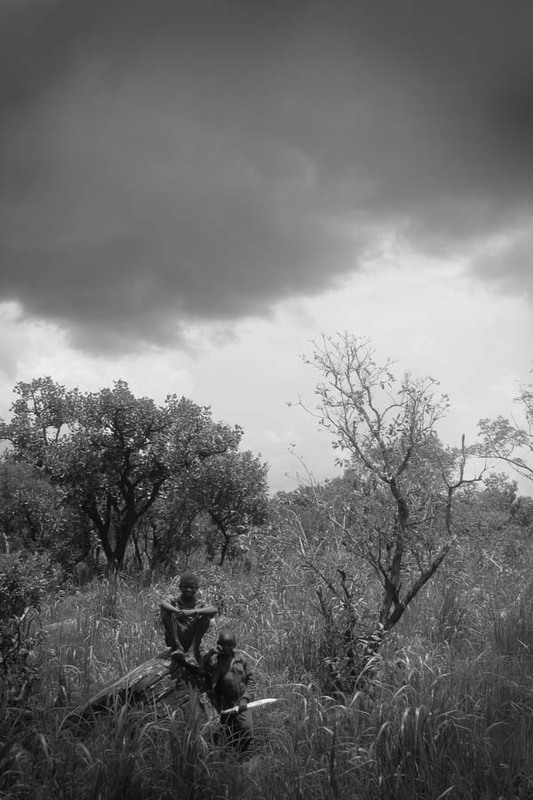 The chief, whose name was Yabada, and all his people fled into the bush, terrified of the strange white people. Eventually the foreigners convinced the people to return to their homes, and under the colonial bureaucracy the village registered their name, Yabada Siguigui, which means “Yabada left”. 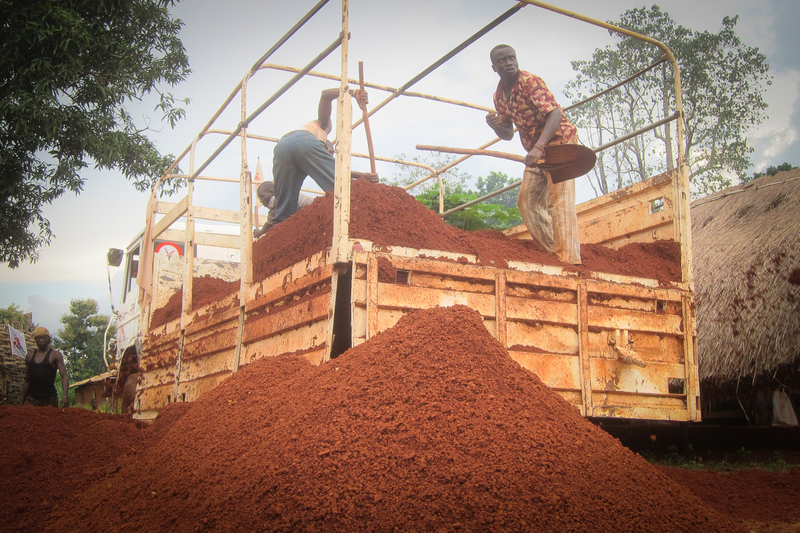 We drove the DAF truck four times to the laterite quarry on Friday, loaded the DAF four times, and unloaded those four truckloads of laterite at our compound to reduce the severity of the frequently experienced inundations that followed any rains. Then, we went searching for stones. 5km along the track leading to Possel, we stopped in the quaint little hamlet of Yabada Siguigui. The village chief came to greet the four of us in our Land Cruiser, his two front teeth set at just the right angle to give the impression he was goofing around, regardless of what he was really saying. We told him we had heard of flat stones sold nearby, and he directed us to drive a kilometre further south, where we could find them. As we drove, trees gave way to brush and tall grasses, the landscape transforming quickly from densely forested jungle to a sort of savannah permeated by outcroppings of bedrock along which the defining lines of the area’s geological history tilted upwards, rebelling against the horizontal inclination of the stony surroundings. Having agreed that the area’s stones would suit our needs, we pulled a U-turn. Back in Yabada Siguigui, from the driver side window, we exchanged a few words with the grinning chief. He assured us that he had stones prepared, so we arranged to return the following morning with a truck to load up. 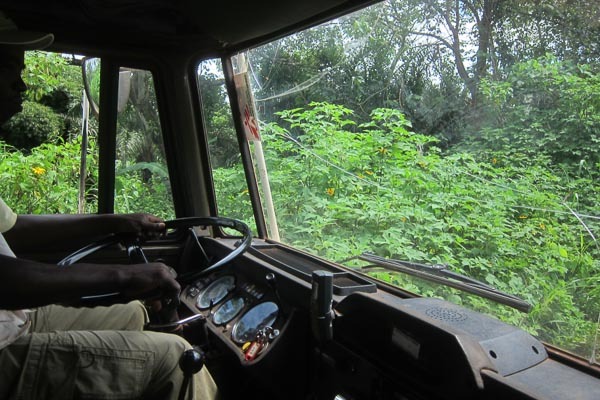 Saturday morning Sunday morning, according to schedule, I climbed up into the cab of our big transport truck, an old DAF paradoxically equipped with four-wheel drive but road tires. Six daily workers loaded ten boards measuring four metres each, then hopped up and over the walls into the open-air truck bed. When we came to a bridge, we pulled out the boards and reinforced the bridge deck to avoid taking a morning dip in the water. Having had relatively little rain over the past two days, the dirt road was hardened, and our truck rolled along with barely a care in the world. Following a few minor jostles and jolts, our merry band arrived in Yabada Siguigui. The chief and an impressive entourage of local youths joined us in driving south to the area. After parking the truck, the chief led a column marching eastward, single file, down a footpath toward the stones. 15 minutes later, the village chief resignedly admitted that he no longer recalled where the piles of stones lay. 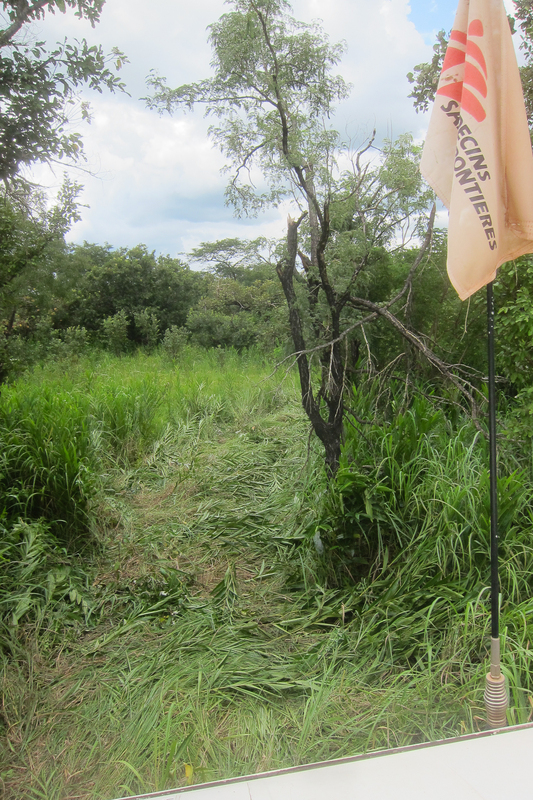 Boys with machetes fanned out through the grass to search, and they eventually succeeded. The mound of stones was about 50 metres north of the footpath, in the middle of nothing. Discussions began in earnest as each of the village’s self-declared civil engineering experts (i.e., everybody) trumpeted his opinion on the ideal route for the truck to make its way to the site. 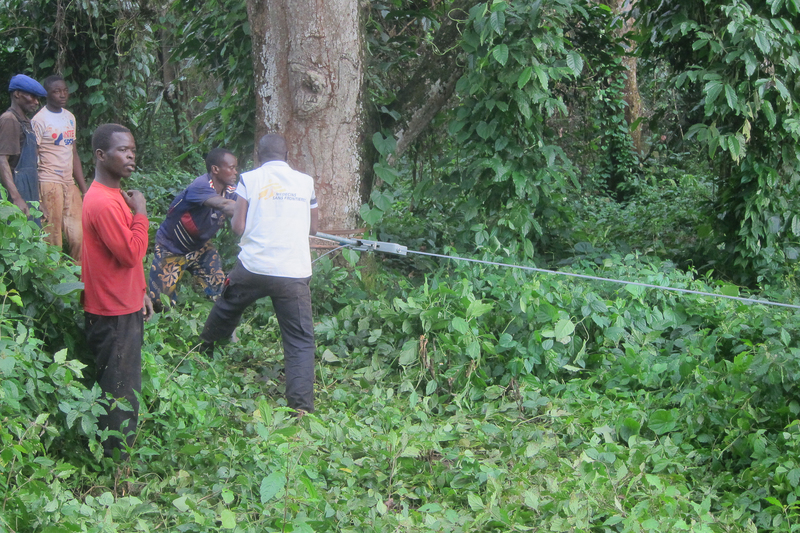 I asked if our daily workers and the villagers couldn’t slash a path through the plant growth with their machetes. I blinked and they had already cleared the first few metres. As the boys hacked away, I sat with the chief to negotiate a price. In negotiating a fair price, we reminded the village chief that MSF provides medical care, free of charge, encouraging him to give us a good price as a favour for a charity working to help his people. As carefully chosen words rolled off of tongues and into ears, the chief took hold of the hem of his shirt and in a smooth motion slid it up and over him. There were three main scars on his back: two on the right side, one on the left. 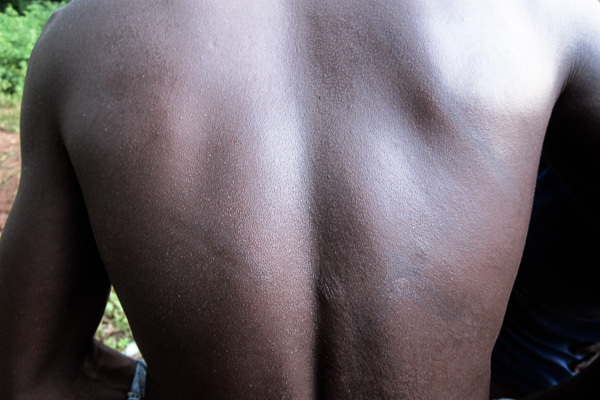 He told us that the streaks, angled upwards away from the spine, were the marks of his time held prisoner by one of the armed groups active in the area, who accused him of being a leader of the other armed group. Our discussion turned to other subjects, and a few minutes later the boys returned to tell us that a channel had been cut for the DAF truck to make its way through the grass. Yvon, the driver, rumbled into position; in half an hour, as children sat staring at the strange white man making funny faces, the truck was loaded. We started back toward the village at a slow pace, cognizant of the cargo’s tremendous weight. All was going well until, just as we began turning from the cleared track onto the well-worn path, we all heard the sound every bush driver dreads: the rapid rush of air escaping from its rubber prison cell. One of the village boys had cut a small tree but left a pointed stump about two hands high, hidden from view by the cut grass. Out came the red bottle jack, elbows dropped to the ground, and then… nothing. The jack wouldn’t lift. No problem, we thought to ourselves, we’ll just use the other jack, a navy blue one. Just our luck: the second one did jack squat. I was surprised when Yvon brought out a third bottle jack, this one black. Astonishingly, three of three jacks failed us. 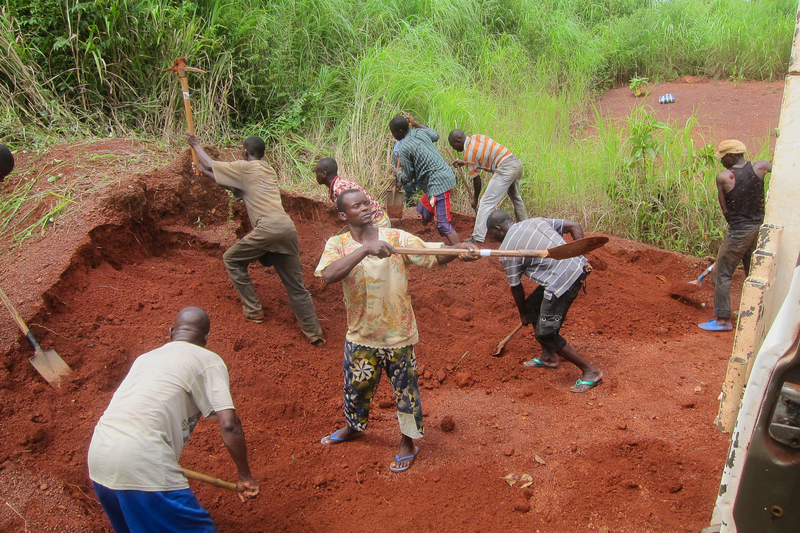 I phoned back to our base in Grimari, asked another driver, Zacharie, to bring more jacks. The day had been incredibly hot and muggy, flies harassed us as most of us sought shade from the overbearing sun, but gradually a refreshing but worrying wind picked up from the west, a telltale sign of an impending storm. An hour into our ordeal, after much tinkering, Yvon got the red jack working. The next obstacle was removing the enormous truck tire. 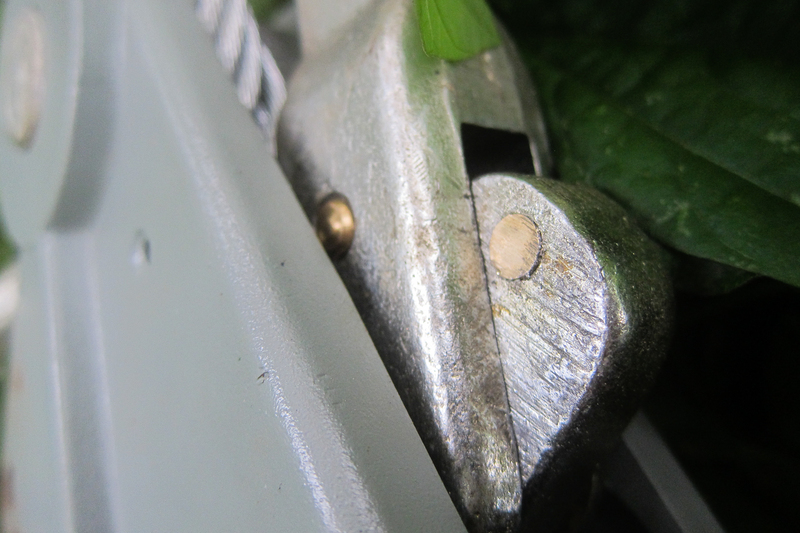 Normally, this would take a few minutes, but we had the joy of pulling off washers that had cracked in multiple places, effectively transforming them into lock-washers. As we struggled to free the wheel, the cool wind brought towering clouds overhead. Lightning crashed and thunder boomed to the west of us. And then, a particularly harsh and ill-timed deluge of water roared deafeningly downward, drenching us in seconds. The rain refused to weaken, remaining steady for over half an hour. Just as Zacharie arrived in a Land Cruiser, the sun began to shine, and a few minutes later the rain ceased. Yvon managed to remove the wheel, and Zach helped mount the spare. Finally, after over two hours, we again moved forward. 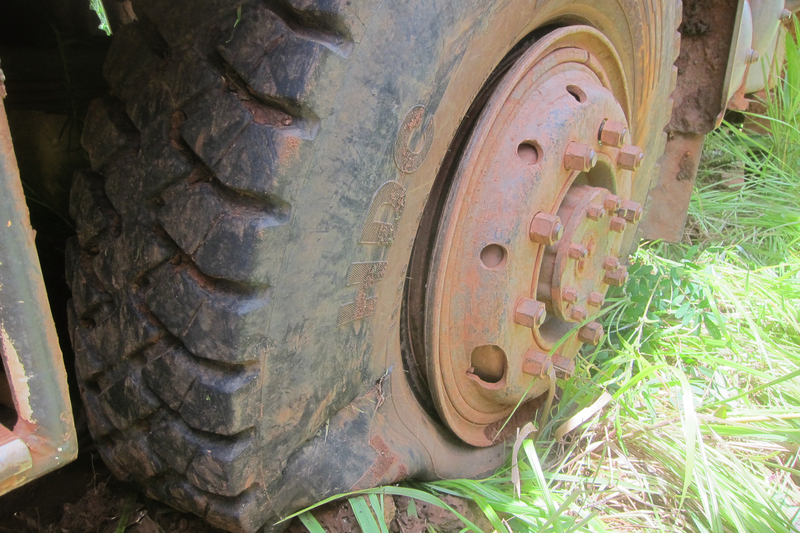 Our joy was short-lived: in fewer than a hundred metres, the truck got stuck in the mud. A brand new tow strap and shackles linked the rear of the Land Cruiser to the front of the DAF truck, and in seconds our pitiful convoy was freed to continue. This time we made it the full kilometre back to the village, Yabada Siguigui. I pulled two purple notes from my wad of cash and slid them into an easily accessed pocket, ready to pay the village chief for the stones. But then we got stuck in the mud again. This same road had been a piece of cake a few hours prior, but had severely deteriorated during the day’s downpour. Five minutes of digging and the Land Cruiser was able to tow the truck out. Not more than twenty metres further on, the truck’s tires were once again spinning uselessly in the mud. Shifting the truck into reverse, the Land Cruiser towed it from the other end, and again succeeded to free the beast. We decided to try for a different route, but this time the truck got so deeply stuck that it took over an hour and a half to move it, using every imaginable strategy. By this time we had offloaded all the rocks. We ran a metal cable around a magnificent mango tree and began using our brand new manual winch, but a brass pin sheared off in two places as we pulled the lever back and forth, rendering the winch completely useless. I showed the drivers how to use a Hi-Lift jack horizontally as a makeshift winch, but we didn’t have enough chain or rope to set it up that way. We put metal mud boards down but, designed for Land Cruisers, they were too stubby and did nothing to increase the heavy truck’s traction. By 16:30, the truck finally lurched backwards, out of the deep ruts it had dug, and up onto more solid ground. Again we made a quick assessment and chose a new route to get through the village, crossing fingers that we could manage without further incident. After just fifteen metres, the passenger-side rear wheel slurped into what may as well have been quicksand. Thirty minutes spent digging the wheel out, placing rocks, and multiple failed attempts at towing, eventually led the truck back onto stable ground. It was nearly 17:00, so we set off to try and make it back to Grimari before our 18:00 curfew. We returned empty-handed to our base, arriving at 17:58, just in time. A few minutes later, just for good measure, it rained some more. This entry was posted in Africa, Central African Republic, Humanitarian and tagged MSF, Ouaka, Yabada Siguigi.